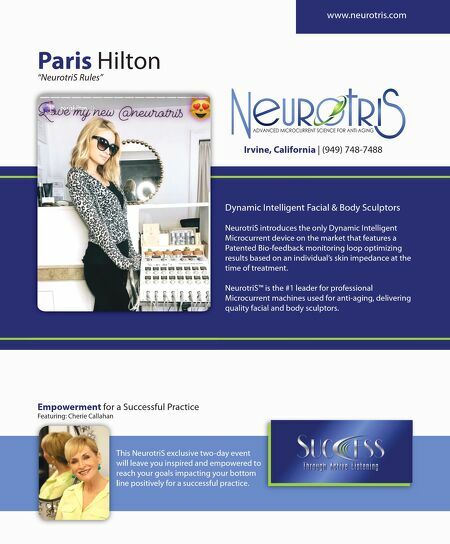 www.ascpskincare.com 29 expertadvice FEED YOUR FACE Facts vs. Hype Do collagen supplements do anything for skin health? by Alex Caspero Your Instagram feed is likely filled with beauty influencers who blend collagen powders into smoothies, stir it into their coffee, or mix it into their oatmeal while raving about the radiant complexion it gives them. Collagen, the most abundant protein in the body, is the main building block of skin. We are born with an ample supply of collagen; consider a baby's plump, fi rm, and rosy skin, due in large part to generous amounts of collagen. Unfortunately, those levels drop 1–2 percent each year starting around age 30. In addition, sun damage, smoking, exposure to pollution, and weight fl uctuations can further diminish collagen production. As collagen levels decrease, the skin loses structure and plumpness, and fi ne lines and wrinkles begin to appear. Collagen-containing pills, powders, and juices have become all the rage in an eff ort to replenish losses. But are they eff ective? 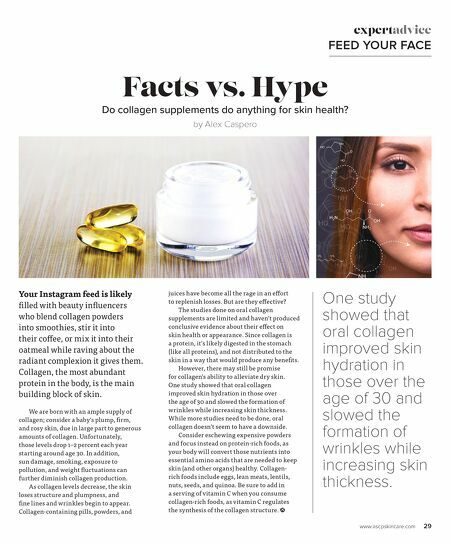 The studies done on oral collagen supplements are limited and haven't produced conclusive evidence about their eff ect on skin health or appearance. Since collagen is a protein, it's likely digested in the stomach (like all proteins), and not distributed to the skin in a way that would produce any benefi ts. However, there may still be promise for collagen's ability to alleviate dry skin. One study showed that oral collagen improved skin hydration in those over the age of 30 and slowed the formation of wrinkles while increasing skin thickness. While more studies need to be done, oral collagen doesn't seem to have a downside. Consider eschewing expensive powders and focus instead on protein-rich foods, as your body will convert those nutrients into essential amino acids that are needed to keep skin (and other organs) healthy. Collagen- rich foods include eggs, lean meats, lentils, nuts, seeds, and quinoa. Be sure to add in a serving of vitamin C when you consume collagen-rich foods, as vitamin C regulates the synthesis of the collagen structure. One study showed that oral collagen improved skin hydration in those over the age of 30 and slowed the formation of wrinkles while increasing skin thickness.